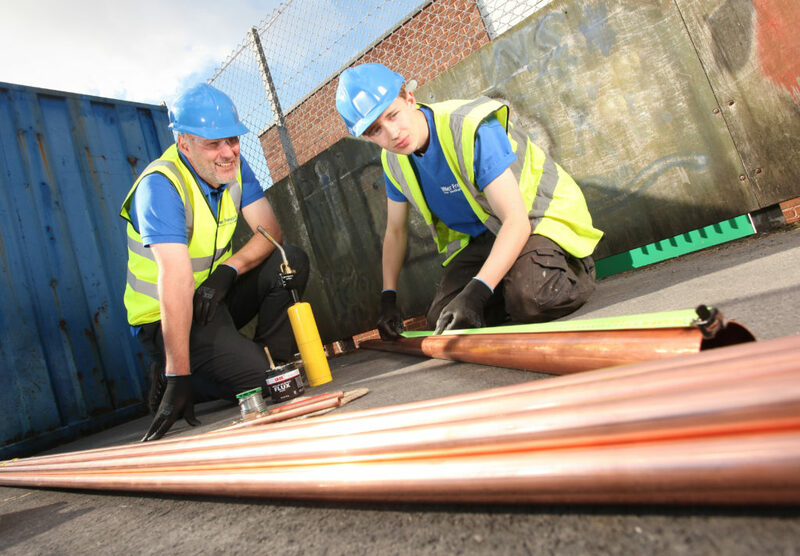 A teenager with his sights set on a career in the construction industry is gaining valuable on the job experience as a heating engineer, thanks to an apprenticeship with Nottingham-based Miller Freeman & Sons, a supply chain partner of Robert Woodhead Limited. 17-year-old Owen Howitt from Wilford, Nottingham has helped to install heating at The Museum of Nottingham Life’s Rock Cottage and is now onsite at Blaby District Council’s new refuse bin collection depot in Leicestershire. Formally a pupil at West Bridgford School, he is now studying on day release for an NVQ level 2 in plumbing at Basford Hall College and is thrilled to be gaining valuable experience on a range of commercial and industrial sites. “I’ve been involved in some really interesting work since I started my apprenticeship last year, such as installing pipework for a central heating system at Rock Cottage,” he said. Owen is an apprentice heating engineer with Nottingham-based Miller Freeman & Sons (Nottingham) Ltd, which has been delivering work through the empa framework sub-contracted by empa partner Robert Woodhead Limited. The East Midlands Property Alliance (empa) framework improves the procurement and delivery of construction projects for the public sector and has its own construction training academy. The training academy has not only seen its nine framework construction partners create apprenticeship opportunities, but work which is sub-contracted to smaller firms has meant that those businesses have been able to create apprenticeships, too. Andy Humphrey, office manager from Miller Freeman & Sons, said Owen was settling in well to his apprenticeship. Caroline Brooks, supply chain co-ordinator at Robert Woodhead based in Edwinstowe, said: “Building great relationships with sub-contractors like Miller Freeman is very important for us to provide the best possible service for our clients. Ian Towlson, regional framework manager at empa, added: “Boosting local economies and creating employment opportunities for local people is intrinsic to empa’s work. “Key to this is the engagement of local supply chain providers. It’s not only our framework partners who are important to the delivery of empa projects, the contribution made by high quality supply chain providers is vital. The East Midlands Property Alliance (empa) was formed by local authorities and is managed by Scape Group. It aims to save time and taxpayer money on public sector construction projects. Find out more about the work of empa at www.em-pa.org.uk or join the conversation at @empa_ii.